View all your artifacts progress, and solve them in one compact frame. Also you can view all your artifact history neatly sorted by race, and a list of dig sites. You can left-click the keystone button to attach keystones (or right-click to remove), or if you prefer there are options to automatically use keystones! You can monitor the artifacts progress, or how close you are to the fragment cap. Make sure to exit the game before/after updating addons. For past changes, visit the Changelog page. If you're curious about planned features, visit the Upcoming features page. Any Bug reports/Comments/Suggestions/etc... are appreciated. For feedback, please use the project's issue tracker on CurseForge. Please open a new issue if you are experiencing bugs, and include as much detail as possible. Make sure you didn't miss the known issues section, and check open issues before you create a new one. 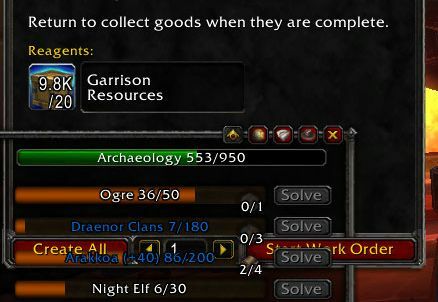 Hello and thank-you for making a relatively recently updated addon for Archaeology! 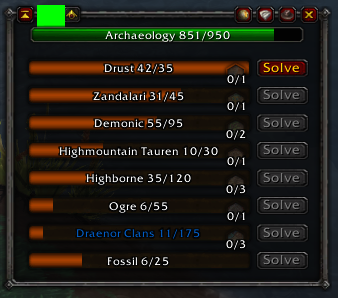 I was a heavy user of Archy and Archaeology Helper up until BfA broke both of those and they were (and are still) not updated. While I can understand and sympathize with the requests below requesting inclusion of some or all of the features of those two addons into MA, I understand if you decide not to. Make the Digsites window close when you reclick the button on the MA interface (i.e., make the button a toggle). Same with the History window. Make the Digsites window auto-close when you click the mini-map button to close the MA main window. Same with the History window. Hi there, and thank you! I'm currently swamped with my day job, and RL stuff, so I can't promise anything right now. I appreciate your suggestions, I'll definitely work on these in the future, and I'm still considering the suggestions from other archaeology addons too. Great addon, any chans of making a Archy style Survey? Are you referencing the double right-click to survey/dig? This is literally the only thing I want!! I can't find any more archeology addons that do this. Archy had it and it was amazing. Did I mention thats all i want? - Double right-click to survey/dig! Hi, thanks for great addon, always used this one. However I noticed with recent update(s), that the UI auto-hides during combat which is really annoying for me. I tried looking for a potential setting to disable this, but found nothing. So where is the setting hiding if there is one, and if there isn't can we have one, so people can control show/hide during combat? Seems like an easy toggle option. Unfortunately the crate button uses a Secure function, which prevents the addon from doing certain things in combat lockdown. That means the addon can not be hidden manually in combat, if you have left it open, (with some lovely lua errors about combat lockdown) which is kinda annoying when you're fighting a raid boss for example. With that secure function in place, the only way to hide the addon in certain combat situation is by automatically hiding it when entering combat, so I figured that should be fine. There might be a way to remove the functionality of the crate button in combat, I don't remember if I've already tried that one, but I'll give it a go in the near future. Thank you for your work on this addon. Especially in the wake of Archy's long rewrite, it is nice to have another modern addon for the profession. Would you please consider adding an actual Surveying UI feature not unlike that of Archy? That is to say, a small UI element that includes a button to actually cast Survey and then upon doing so spawns a "distance tracker light" that tracks the distance from the last cast. Listing the both the distance traveled from last Survey cast numerically and offering a color background indicator (ie Green for 0-40, Yellow for 40-80, Red for 80+ , with this color and measurement being roughly the same as the blinking light on the surveying tool itself when the Survey Ability is used ) this information helps users know when to cast Survey next. Archy helpfully slipstreamed all this functionality into the addon itself, so that users would have the easier time and not have to devote additional macros or general hotkeys really enhanced the profession and nicely complimented the more collection-related features that the addon offered. I think the same could be said for Minimal Archeology, really cementing it as an all around addon for the profession were these functions added. Do you think this may be possible? Thank you. Thanks for the suggestion! I'm not planning to work on any new features at the moment, but It's definitely possible in the future. Green square for the... crate button, I assume? I really like your addon! Only one issue that I've come across: the status window is apparently set for a high layer, as vendor crafting interactions get partially covered by the MA window (not solid, parts of each of the windows are visible and interact normally); normal vendors work fine and appear whole over the MA window. Aside from this little bother, it's pretty essential to my WoW experience! Thanx! Thank you, I'm glad you like it. I'll get this fixed in an upcoming version. I miss some of the features of the Archy addon. One that I use most often is the button to crate an artifact. I would put it next to the tom-tom integration button or on the left hand side in the same frame that contains the Solve buttons (put the buttons in two groups - on the left are buttons that do stuff such as crate or make waypoint, on the right is buttons that show the windows). The crate button would be enabled or highlight itself when an artifact exists in your bags. There are options to hide or show races in the add-on setting. I would like a separate option to automatically only show races belonging to the WoW expansion of the current zone. Maybe this should be a button in the Races window - to switch between expansion of zone, and all races quickly. The Races window grows according to the number of races shown. I would like an option to do the same for the Progress window so I can see all the artifacts for a race at once without scrolling. - races with artifacts you can solve. I added 1) and 3) to my To-Do list. I see the new "Relevant only" button in the UI. It works great, but wouldn't it be better to make it a small button like the tom-tom feature, in keeping with the "minimal" name of the add-on? It could use the minimize/maximize icons (- and ). I guess you're right, I'll see what I can do about it. I think maybe the event is happening before the addon is completely loaded, as RefreshDigsiteWaypoints is defined in MinArchNavigation.lua instead of MinArchEvents.lua? Nevermind. It's just user error: I updated the add-on without restarting the game. Navigation is a new feature defined in a new lua file. That means /reloadui is not enough to make it load completely.